Without being preachy but being fun and meaningful, your wedding will be memorable and have just the right touch of inspiration. I've got 28 years experience as a wedding minister/officiant. I love doing weddings!!! I meet such great people and enjoy telling your love story. It's no surprise (but I'm extremely appreciative) that time after time I hear, "this is the best wedding ceremony I've ever heard!" I am open-minded and responsive to the tone you want to set with your wedding and I can give you as much direction as you want -- or not. It's up to you. I am LGBT friendly. I donate to an animal rescue organization in honor of your marriage. My ceremonies are spiritually-centered rather than religiously oriented, but it is important to me that your ceremony conveys the love you have for one another. I provide a packet containing a large selection of vows, readings and additional ceremonies to choose from, or you may write your own vows. $450 is my average price for a ceremony located in Antrim, Kalkaska and Benzie Counties, however, I do prefer to discuss cost with each couple on an individual basis. A rehearsal is an additional fee. 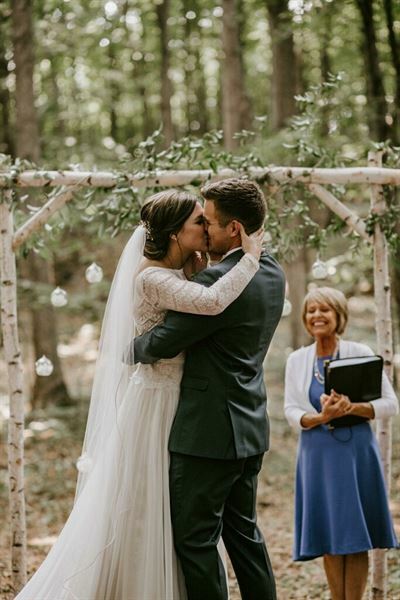 $500 is my average price for a ceremony located in Emmett and Leelanau Counties, however, I do prefer to discuss cost with each couple on an individual basis. A rehearsal is an additional fee. Do you prefer to minimize the complications that come with a large wedding? Consider the Easy Going Wedding package. Package includes beautiful wedding ceremony customized for you and your life partner, registering your license with the appropriate county clerk and a surprise bonus. A donation is made in honor of your wedding to an animal rescue organization. $150 deposit due within 10 days of agreement being reached. Or pay in full for a $25 discount. 28 years experience. $450 is my average price for a beautiful ceremony located in Grand Traverse County. However, I will discuss the cost with you on an individual basis. A rehearsal is an extra charge. Special Features: I marry fun-loving people ... to each other. From contemporary to traditional every ceremony is unique and tailored to you. The process is easy and fun. A donation is made to an animal rescue organization in honor of your marriage.